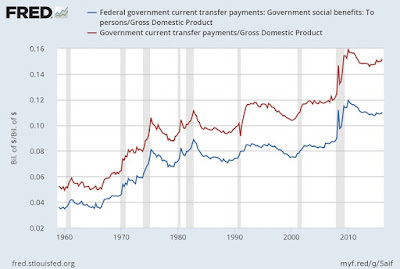 Government in the United States, especially at the federal level, has become more about transfer payments and less about provision of goods and services. 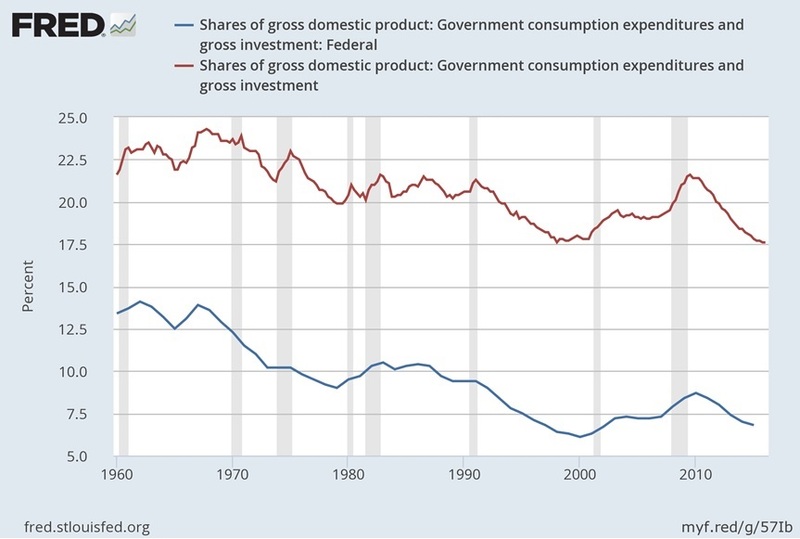 Conversely, the category of "government consumption expenditures and gross investment" has been a generally falling share of GDP over time. The top red line shows this pattern for government overall, including federal, state and local government. 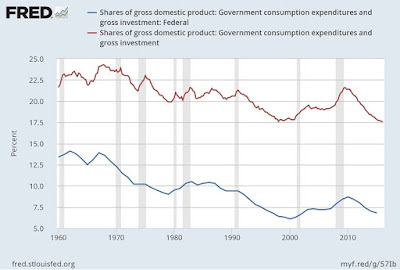 The blue line shows just federal spending on "government consumption expenditures and gross investment." Back in the 1960s, the federal government was spending about 12-13% of GDP "government consumption expenditures and gross investment," which was more than the state and local government spending of about 10% of GDP in these categories (as shown by the gap between the red and blue lines in the second figure). Now the federal government is spending about 7-8% of GDP on "government consumption expenditures and gross investment," which is now less than state and local government spending of about 10% of GDP in this category. State and local government has continued to be about provision of goods and services, from education to roads/transportation to law enforcement. 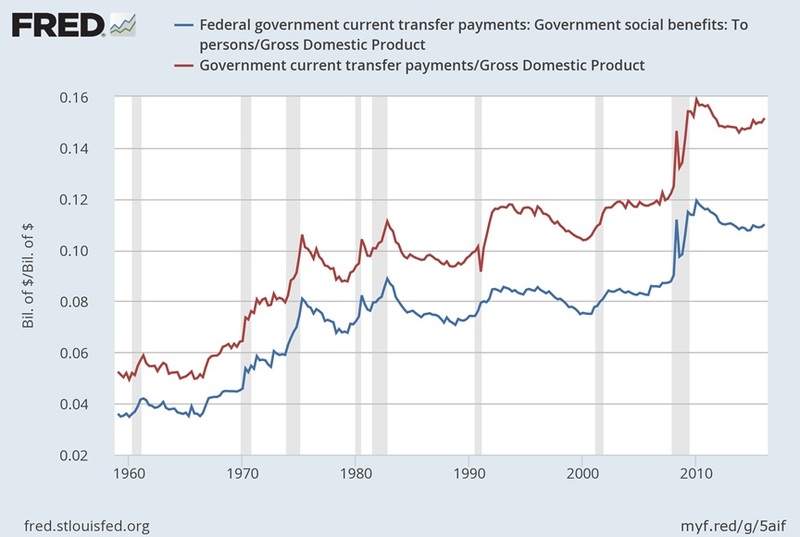 But over time, the federal government in particular has become less focused on "government consumption expenditures and gross investment," and more focused on transfer payments. The political economy of such a shift is simple enough: programs that send money to lots of people tend to be popular. But I would hypothesize that this ongoing shift not only reflects voter preferences, but also affect how Americans tend to perceive the main purposes of the federal government. Many Americans have become more inclined to think of federal budget policy not in terms of goods or services or investments that it might perform, but in terms of programs that send out checks. For those who are interested, one way of measuring gross domestic product is to add up the sources of demand in the economy: consumption plus investment plus government plus exports minus imports. In this formula for GDP, the "government" category includes only "government consumption expenditures and gross investment," as explained here by the US Bureau of Economic Analysis. In contrast, transfer payments become income to those who receive them, and thus are counted in GDP when the recipients spend the money to consume a good or service.